So you took a leap of faith and adapted your site to support the AMP (Accelerated Mobile Pages) format? This can be quite the constraint at first but it pays off in the longer term because it will make your content both more accessible on mobile devices and more visible in Google search results. The snippet above should cover 90% of your requirements – track a pageview for property UA-XXXXX-Y (replace with your own property ID). Feel free to play with the triggers element by adding variables. This would be the way to add virtual URLs or custom dimensions/metrics if you’re an advanced user. Refer to the Google Analytics for AMP documentation to explore additional cases. Using Google Tag Manager (GTM) will allow you to trigger tags on your AMP pages, despite some limitations. For GTM support, you will need to create a brand new container of a new, special type labeled “AMP” (hint hint) on top of the existing types for Web and mobile apps. Obviously you will need to replace GTM-XXXXX with the ID of your newly created AMP container. At this point, you can go to your container in GTM and add tags, triggers and variables. You can add a JSON element to handle datalayer variables but do pay attention to the formatting. Whether you chose the “hard-coded” or GTM-powered approach, traffic data to your AMP pages now gets picked up by Google Analytics. So how do I recognize/analyze this traffic? Option #1: You very likely structured your AMP URLs so that they begin with /amp for instance, as seen in your Behavior > Site Content > Drilldown so that you can see how much of your traffic goes to your /amp folder. Option #2: You use a dedicated custom dimension to track AMP status (AMP or Non AMP), which means you’ll need to use a custom report for basic metrics such as page views. This of course implies you setup that custom dimension in your tracking code or via GTM. Option #3 is the recommended option and involves using content grouping based on the URLs of AMP pages. Add two rule definitions: Non AMP and AMP. For the second rule definition (for AMP pages), copy the first definition but this time change “does not contain” with “contains”. There, you’re done! The beauty of Option #3™ is that it requires no extra tagging; content grouping will be automatically taken care of as traffic flows into your Google Analytics property and related views. Using Option #3™ you get reports which you can break down by content grouping. You can now go to Behavior > Site Content > All pages and select your content grouping in the dropdown menu above the report table. This will update your report and show 2 rows: AMP and Non AMP, clearly showing the performance for each page type. EXTRA CREDIT: you can apply content grouping to your Landing Pages report and see how AMP is used to acquire visitors. Cross-reference that with Channel Groupings and you’ll be golden. There you have it, Option #3™ is a simple, effective method to see the impact of your AMP “migration” on your traffic and conversion down the line. As usual, send me your feedback in the comments! Thanks for this post. Just one question regarding the hostname as from what i see, the AMP page remains executed from Google network when the user clicks it from the results page (and therefore now from your own server). How is this affecting GA tracking? this would affect your hostname reports so if you had installed a hostname filter to fight spam, you may want to also include cdn.ampproject.org as allowed hostname. If you have an unfiltered, raw data view, you should be all set. Hi, how to track CLICK URL on AMP pages? I tried all available variables and I could only pass current url (where click was done), not the target url (where I am redirected when I click it). 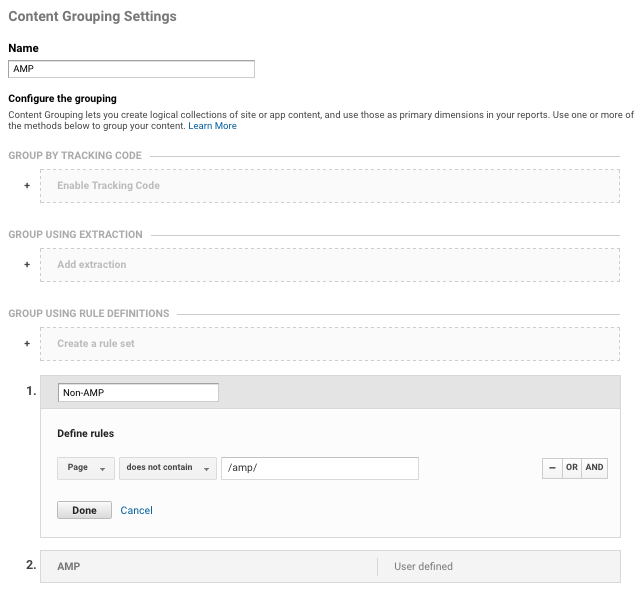 Hi, can you describe how to set content grouping on AMP pages via GTM? Thanks in advance! Thanks for your nice post. but i am not setup amp analytics. when i setup and save then show 404 error. So, can you please provide me an video for this process.